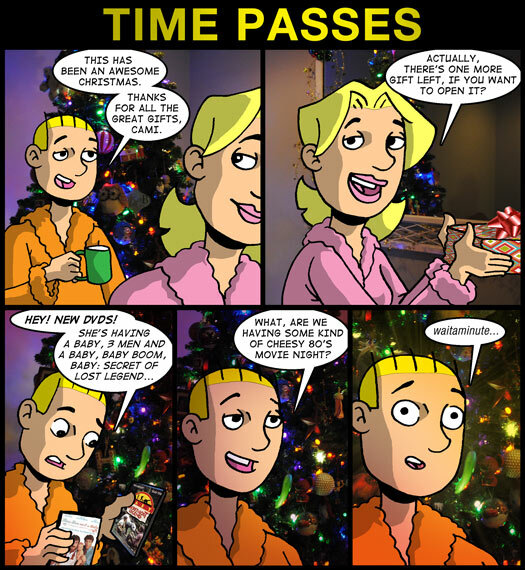 I can’t tell you how long I’ve wanted to make a Baby: Secret of Lost Legend reference in this comic. Now, after 10 years, I’VE FINALLY DONE IT! Feel better? I know I do. Turning our attention toward the comic, I want to let people know that this is NOT how Cami informed me that we were pregnant with Henry back in 2006. It would have been pretty cool if she did, but it didn’t shake out that way. I do remember, however, that Cami had a unique fascination with John Hughes’ She’s Having A Baby leading up to and during that pregnancy – which I didn’t mind because, on the one hand, John Hughes. However, on the other hand… Elizabeth McGovern. Not one of my favorites. I don’t have much more to add to this comic. To be truthful, I’m wiped out. After producing two comics back-to-back with the Christmas holiday thrown on top, I’m actually looking to New Year’s Eve so I can get a little REST! As for Theater Hopper, this is the third to last comic. I’ll produce one more this week – likely Thursday or Friday – and the very last comic will be Monday, December 31. Incidentally, I recently learned that James Kochalka’s American Elf is ALSO ending it’s run next Monday. This was not planned. But now I’m bummed out. I love American Elf. We’re losing a great journal comic, folks. But I’m interested to see where Kochalka goes next. Anyway, that’s all for now. Please share up this comic to put some extra eyeballs on it. If the internet is anything like me, they’re probably a little distracted at the moment!